The campaign, advises riders to “lock, chain and cover your bike”, wherever they park. Moped and motorbike thefts saw a rise in Sussex during last summer and the end of 2018, with various operations being put into action to tackle this. This advice campaign aims to maintain the recent fall in thefts and to support the work that police have already carried out. Advice includes locking your bike in order to make it harder to steal. A chain is another deterrent, making it impossible to wheel away from the parking area. Covering your bike hides what make and model it is, as well as adding another obstacle to would-be thieves. Also think about parking your vehicle in well-lit areas and choosing a location which has CCTV if possible. All these precautions add up to a better-protected vehicle and fewer incidents of stealing. Mopeds and motorbikes are frequently stolen in Sussex in order to sell them on or for joy-riding. 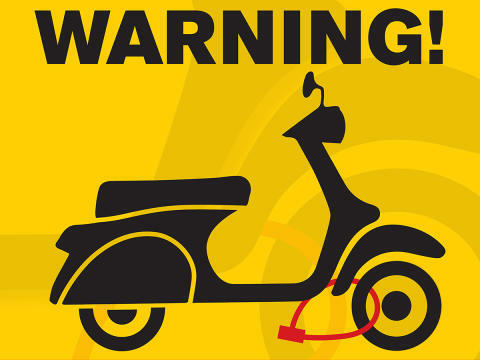 Unlike recent occurrences in London, it is unlikely the stolen vehicles would be used for “moped-enabled crime”, where they are taken in order to carry out a further crime such as robbery, but that does not mean it will not happen. Inspector Brian McCarthy said: “We are appealing to all riders in Sussex to be vigilant in keeping their vehicles safe whenever they are out on the road. You may just be parking for five minutes, or just leaving your vehicle while you run an errand, but that’s all that is needed for thieves to take advantage of an unlocked moped or motorbike.